Sometimes I ponder life's questions. For instance, is the word "ninja" in the UK still considered taboo? Does that mean that this next game would have to be localized to "Hero Battle Heroes"? It's not as catchy. ...Was I going somewhere with that? I don't know. Here's my review of Ninja Battle Heroes for the Nintendo 3DS eShop. Sometimes the most interesting games have the least interesting titles. Other times there are game names that don't do their games justice. Tom Create, a developer who in the past worked on the DSiWare GO Series, has a game that fits both categories with Ninja Battle Heroes. With a vanilla name that could be about pretty much anything involving ninjas, battles, and heroes, the actual product is a charming and challenging 2D side-scrolling platformer that uses the 3D effect of the Nintendo 3DS system very well. Ninja Battle Heroes stars bipedal animals dressed up as ninjas in a Feudal-era Japan. Our hero is Saizo Kirigakure, a member of the fabled Beast Brigade, who returns home to find his fellow clanmates missing. They have been supposedly animal-napped by a Beast Brigade member turned traitorous. Saizo sharpens his blade, a katana that serves as his main mode of attack, leaps into battle, and progresses through over 20 unique levels to rescue his furry friends. Despite the total ridiculousness of small animals with big heads dressed up as ninjas, the dialogue of Ninja Battle Heroes rarely strays from the serious, delivering a fun if not ham-fisted, anime-esque narrative for players to experience through dialogue box character exchanges. It's a battle of two fronts in Ninja Battle Heroes. There's the obvious main battleground where Saizo platforms and performs sword and shuriken attacks to enemies on the same dimensional plane as him. 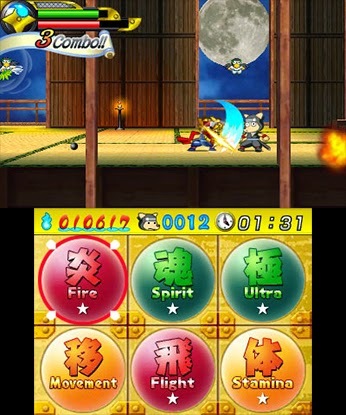 However, Ninja Battle Heroes cleverly utilizes the 3D effect of the Nintendo 3DS to have it where enemies also reside in the background. They can either launch projectiles at Saizo, which the player can dodge by jumping at the last possible moment, or the ones who battle with melee attacks will push forward from the background to where Saizo is. 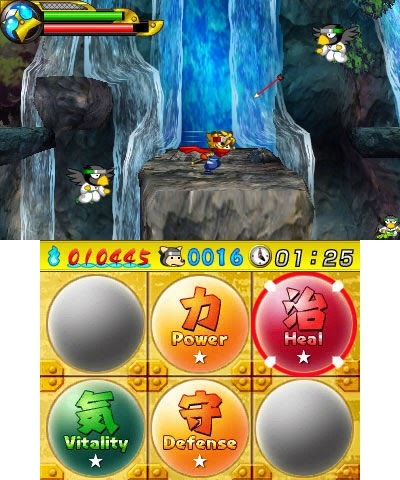 While the Y button is for attacks to enemies that are on the same plane as him, the X button is used to throw shurikens at foes on the background planes. It's a smart concept that is fully utilized to fantastic effect. Several boss encounters have the boss switch between Saizo's platforming plane and the background, where they launch attacks that cover both planes. to mess with Saizo Kirigakure! By no means does this background and main ground gameplay require the Nintendo 3DS' 3D slider to be turned up, but it does make approximating the proximity of enemies in relation to Saizo a much easier task. Each level in Ninja Battle Heroes, whether it's a platforming or boss level, has three optional challenges that can be completed. These range from beating a level within a certain time, getting a certain number of hits in one combo, defeating a number of enemies, among many others. Satisfying the conditions of these challenges unlocks secret skills, one of eight slots to equip said skills, or a healthy heaping of Spirit, which can be used not only as continues when Saizo loses all of his health, but they can also be used to enhance skills and Saizo's attributes. As bosses are defeated and captured members of the Beast Brigade are rescued, each character that rejoins Saizo's side gives him a skill that can be used in the heat of battle by touching one of eight unlockable slots on the bottom screen. These range from restoring his health to elemental attacks that deal the most damage depending on their location. For instance, the Wind summon especially hurts enemies in the background, while the Ice summon damages airborne enemies the most. As stated, these can be strengthened with Spirit in between levels, and they are able to used by gathering Spirit within the levels themselves through holding down the Circle Pad. While the majority of Ninja Battle Heroes does indeed play well, the game is not without a major fault that rears its nasty head into the picture late-game. Later levels fall into a trap of being a labyrinth of confusing platforms, a myriad of ways to go, with most of these routes leading to annoying dead ends. It says something about the levels in the second half of the game when signs displaying directional arrows were required by the developer to help out players with the absolutely horrid level design these later levels contain. It's a huge drop-off in level quality from what is seen at the beginning of the game. Ninja Battle Heroes delivers onto players a pleasant presentation. Sprites are wholly 2D and animate wonderfully while levels themselves are made up of 3D polygons and parts. While the music in the game isn't bad per se-- it uses traditional Japanese instruments-- it is replayed so often that it can get exhausting. 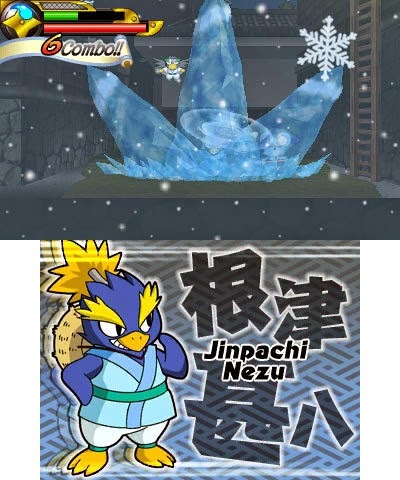 Essentially the same two themes, one for platforming levels and one for boss levels, are what players get throughout their gameplay experience with Ninja Battle Heroes. For such a low cost of entry, Ninja Battle Heroes is of exceptional value. The amount of levels and the optional challenges that have players going through the levels in different ways make for a lot of longevity to this game. The interactivity between the foreground and the background is smartly used, and the gameplay is as sharp as Saizo's katana. The later levels do bring down the fun a bit, but overall, Ninja Battle Heroes is a wise investment for any action-platforming fan.